on May 17 & 18, 2010. 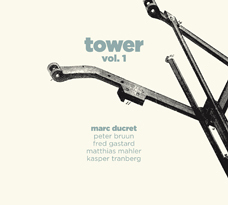 The first in a series of (at least) three recordings documenting Marc Ducret's Tower project, an attempt at a musical rendition of a short chapter from Vladimir Nabokov's novel Ada or Ardor. The music composed to convey Nabokov's text complex structure and writing process – a labyrinth made of mirrors, back and forth moves, and connections – was offered to three different bands, each one bringing its distinctive sound and texture to the 'repertoire' and playing dedicated parts of, or variations on it. The French-Danish quintet of Marc Ducret (electric guitar) with Kasper Tranberg (trumpet), Matthias Mahler (trombone), Fred Gastard (bass saxophone) and Peter Bruun (drums) was the first of these bands. The music on Tower, vol.1 was recorded over two days in between dates on the quintet tour of France, Switzerland, Denmark and Finland in 2010. It was followed a few months later by a French-American quartet, which will appear in Tower, vol. 2, scheduled for release in autumn 2011.